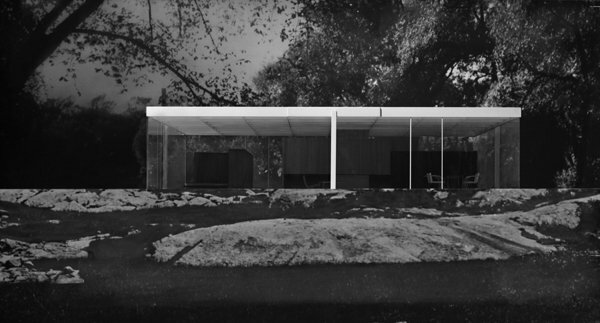 ← The Apollonian and Dionysian in Architecture. 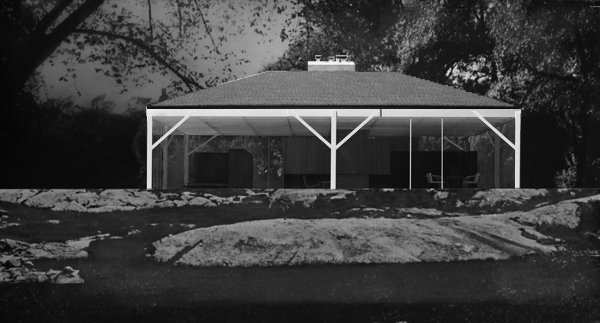 To illustrate one of the concepts in my blog concerning expressive rationalism I have doctored up an image of Mies’ unbuilt 50X50 house. The sequence demonstrates the attenuating power of honesty in architecture. Honesty can obscure the clear diagram of a built work. One must work through a building according to its functional demands, but beyond that, and in order to create architecture, one must go a step further and create poetry out of it. One way this is accomplished is through distillation. Effectively then, the “true” work is revealed in reverse of this sequence; when excessive rationalities are hidden to reveal a truth about the work that is more spiritually honest. also define and confine the rectangular volume. sunshades, or better yet, plaster the walls and insert regualr double hung windows. The architect works through this push and pull between rational and spiritual directives. This push and pull comes internally, with our competing desires for honesty and beauty. The push is also external. The weight of gravity and the necessity of program and clients needs are an obstactle pushing against our own desires. The internal and external duality will be explored further in a later post.